Just weeks after Robby Armstrong bought a new home in 2013, he lost his job when Duke Energy’s Crystal River Nuclear Plant closed, and with two young children he was reluctant to leave his hometown in Citrus County, Fla. But a temporary job working with Duke Energy in North Carolina prepared him for something even better. 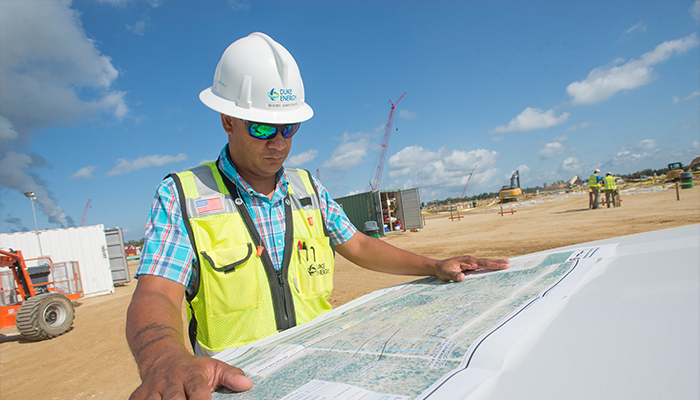 Armstrong now assists the construction manager for the new Citrus County combined-cycle natural gas plant. The plant is one of the largest of its kind under construction and will provide 1,640 megawatts of energy when complete in 2018 – enough to power 1.3 million average American homes. Armstrong reviews construction plans on-site in Citrus County. Armstrong worked various projects at the nuclear plant for seven years before it formally closed in 2013. That closure left nearly 600 employees unsure about their future. Duke Energy promised employees that if they wanted to continue working for Duke Energy, the company would do its best to reassign as many employees as possible. About half of the affected employees found new jobs in the company, about 100 stayed to work on the decommissioning team, and the remaining were offered severance packages. Most of those offered severance retired or moved on to different jobs. Armstrong accepted an 11-month Duke Energy position in North Carolina reviewing the company’s coal-ash operations, which gave him a chance to expand his skills. 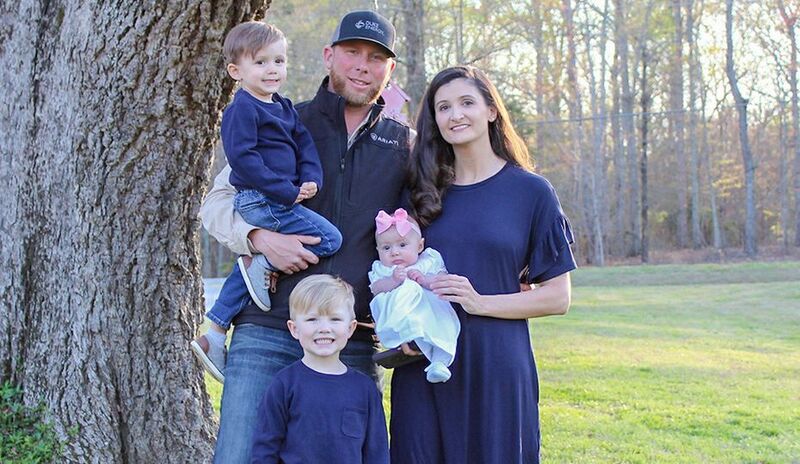 But in North Carolina, he was away from his wife, Heather, and young kids, Jalen and Jada, so an offer to come back to Citrus County to work on the new combined-cycle project was great news. 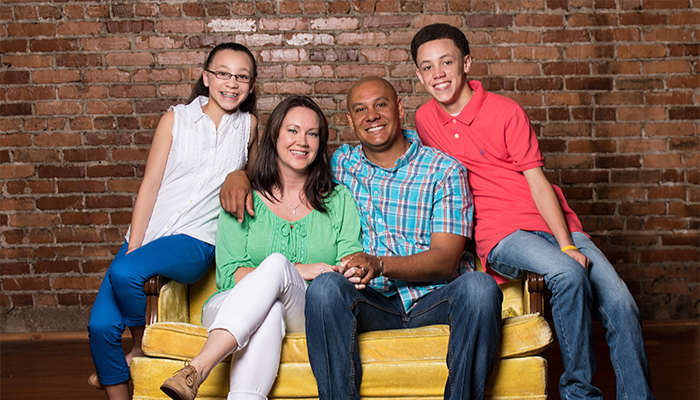 Armstrong and his family from left to right: Jada, Heather, Robby and Jalen. During the height of construction, the project will create 600 to 700 temporary construction jobs in an area where jobs are scarce. Citrus County has the state’s third-highest unemployment rate at 6 percent, according to the Florida Department of Economic Opportunity’s most recent report in May 2016. After construction, the plant will need 50 to 75 permanent workers to operate and maintain it. 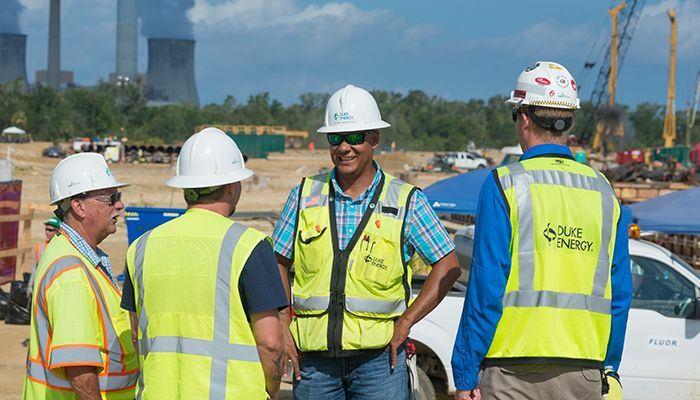 As the largest private employer in the area, local leaders were concerned about the loss of high-wage jobs and impact to the local economy when the nuclear plant closed. 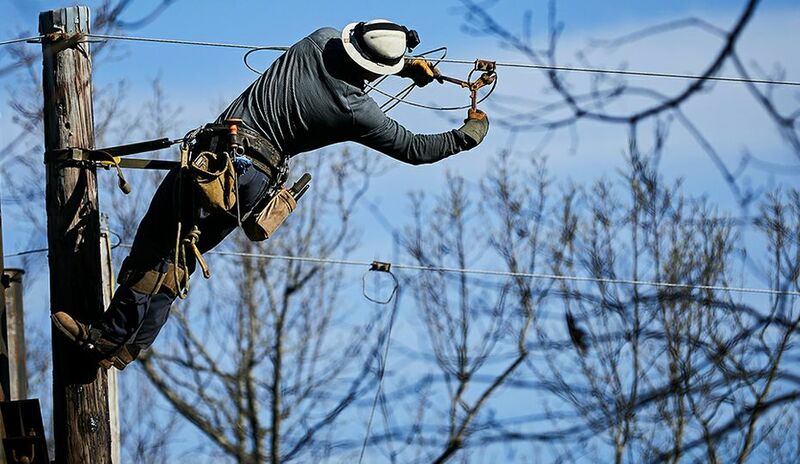 But between the new jobs and money spent on materials from local suppliers, Duke Energy estimates an economic benefit of more than $600 million. Armstrong was born and raised in Citrus County by his mother, Florine Armstrong, a florist, and father, Robert “Bobby” Armstrong, a Duke Energy employee celebrating 35 years with the company in 2016. His father is a supervisor at the breaker shop at the Crystal River Energy Complex and was an electrical instructor at the nuclear plant for 14 years. Before the layoff, Armstrong planned to stay in his hometown surrounded by friends and family. Armstrong said the layoff forced him to eliminate the restrictions he placed on himself and branch out, which resulted in his new position. With his promotion to senior construction specialist, Armstrong is managing field activities at the construction site. 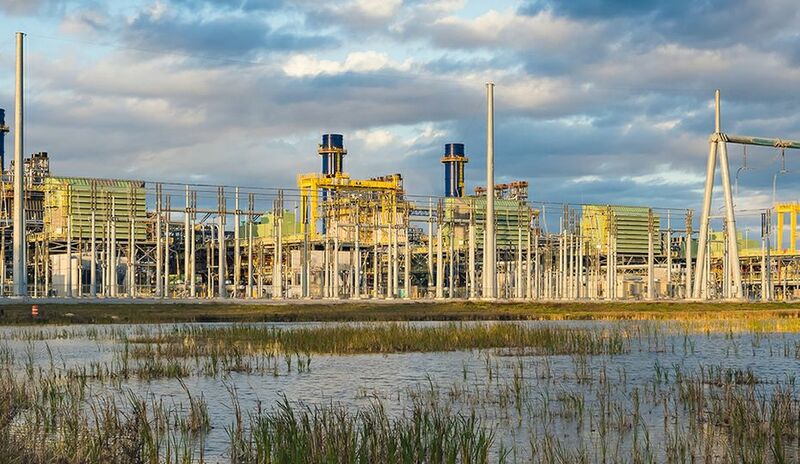 The combined-cycle natural gas plant’s first 820 megawatts are expected to come online in spring 2018, and the second 820 megawatts are expected to come online by December 2018. The new plant will replace generation from nuclear and coal plant retirements. Retiring coal plants and building more natural gas plants are part of Duke Energy’s efforts to provide customers with cleaner energy. Since 2005, Duke Energy Florida has reduced air emissions by nearly 80 percent and carbon footprint by 17 percent. The new plant will use efficient natural gas technology, emitting half the carbon of coal-fired plants. Armstrong, center, speaks with his team at the Citrus County construction site. Duke Energy is constructing two other combined-cycle projects in the Carolinas. The W.S. 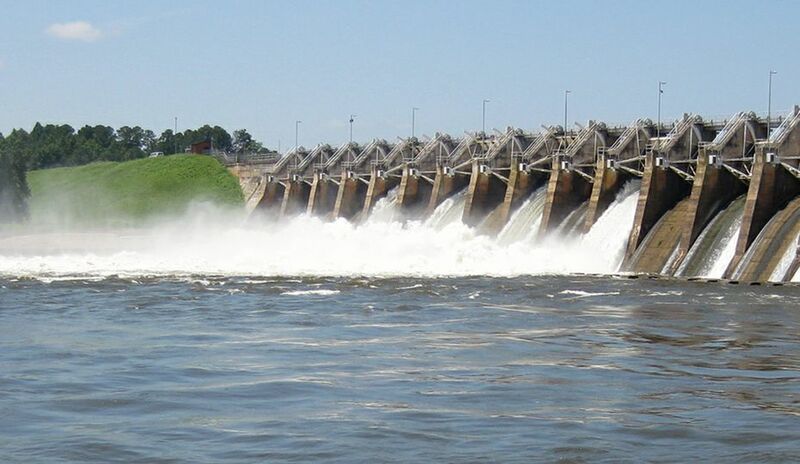 Lee plant in Anderson County, S.C., will generate enough energy to power about 600,000 homes, and the Western Carolinas Modernization Project in Asheville, N.C., will generate enough energy for about 448,000 homes. Armstrong said he is excited to see what the future holds. Now that his children are teenagers, he is ready to go anywhere. 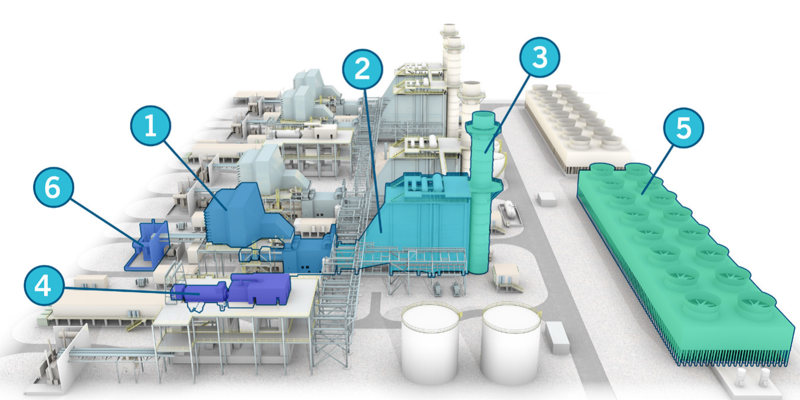 How does a combined-cycle natural gas plant work? 1. Combustion turbine: A combustion turbine operates like a jet engine by drawing in and compressing outside air to a high pressure. The pressurized air, mixed with natural gas, is burned to create hot exhaust gases that power the combustion turbine and spin a generator. 2. Heat recovery steam generator: Combined-cycle technology is considered highly efficient because of this heat recovery system that captures heat from the hot exhaust gases and produces steam to rotate another generator. 3. Stack: The heat recovery steam generator releases exhaust gases through the stack at a highly reduced temperature. 4. Steam turbine: Steam generated by the heat recovery system powers a steam turbine that rotates another generator to make more energy. 5. Cooling tower: The cooling tower reduces the temperature of the water before it is returned to the discharge canal that flows into the plant’s water source. 6. Generator step-up transformer: The step-up transformer is like a converter. It takes electricity from the combustion and steam turbine generators and increases the voltage so Duke Energy can transport energy from the plant to large transformers and then to your house.